Calamity Jane, called “CJ” by her current family, and “Janie” by me, was six weeks old at Christmas time, 2012. So she has just turned one year old, and I designated her birthday at November 15. Originally with a couple on my street, she came from the home of a breeder in Lubbock, Texas, though she was not registered. She was a Christmas gift from the couples’ children. They really were not interested in having a puppy and gave Janie to the family next door who have four children, three under the age of 6. The children who thought they wanted a puppy butsoon lost interest. The mother does her best but she is overwhelmed with caring for her family. The puppy has been left in the backyard for almost a year with little contact from the family and none with the outside world. She has been fed and has shelter of sorts, not abused but definitely neglected. In addition, the family rents the house and is not supposed to have a dog, so they agreed to have her adopted. On October 14, 2013, Janie was spayed, tested negative for heartworms and intestinal worms, and was given her rabies and initial vaccinations. She weighs 45 pounds. 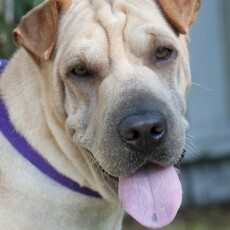 Janie is energetic, craves attention and would love to come inside the house. She is loyal and highly intelligent, plays with toys like a puppy if someone will play with her. Over the last two months, we two volunteers have taken her for walks her so she can get acquainted with the rest of the world. She is very shy with strangers but has made great progress in meeting people if she is with one of us. 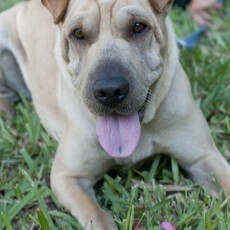 She likes other dogs and wants to greet them; however, she has had no experience and so can be a bit rambunctious. But she has shown no aggressiveness whatsoever, just great curiosity about the world outside her yard. Janie loves the children in the current family, even gets in their kiddie pool with them on the few occasions they are outside in the summer. She probably would do best without cats in the home, as she loves to chase anything that moves: cats, squirrels, leaves…. 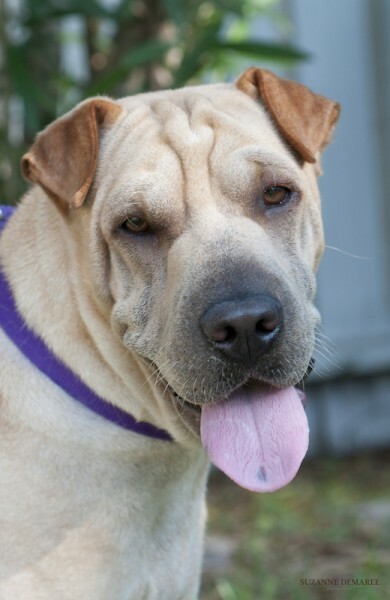 Janie will be a wonderful, loving, cheerful companion for the lucky family that is blessed to adopt her.